Purchasing any of these items qualifies you to receive FREE SHIPPING on the added items only. We ship all over the United States, everyday from our location in the beautiful Upper Peninsula of Michigan. 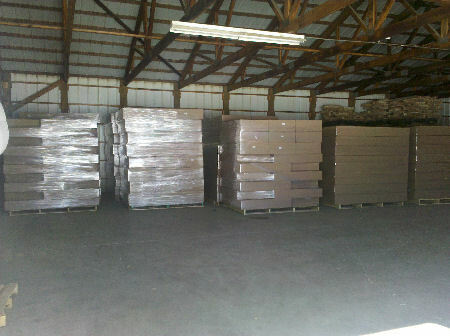 Depending on what you order, we will ship our products through UPS, or Freight on a pallet. When you order something that will come UPS, you will not have to be there to have them drop the boxes off. For shipments that require a freight company(LTL), stuff that is palletized, someone will have to be at the destination to accept the pallet. The shipments that are LTL, are what they call curbside delivery, what this means is they will deliver the pallet to the back of the truck at the destination. 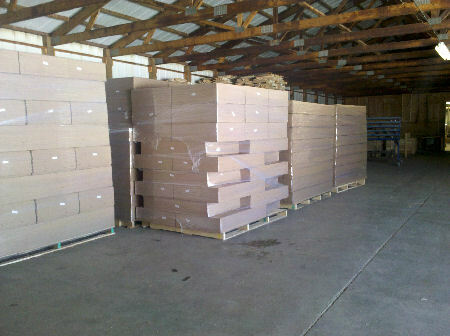 It will be your responsibility to get the pallet off the truck. Most of your customers just cut the banding and wrap and take each piece of themselves, this is not hard to do. The LTL shippers do have a service where they will unload the pallet for you, but for a upcharge which is usually $100. So you can save yourself some shipping cost by having some help taking off the pallet or just unwrapping the pallet and take of each kit or piece. We recommend inspecting each shipment for any damages or dents you see, please note it on the bill of lading, this doesn't mean the item is damaged, but it will help down the road if you find something damaged later, for us to get money back from the freight company. Remember all of our furniture comes with easy to read instrucitons and hardware for assembly and for some items we have on our website links of videos on how to put them together. Assembling the kits is really easy, holes are already drilled and the furniture has already been put together, so please dont be nervous about assembling the kits. We will walk you through it on the phone if you have any troubles assembling the kits, we want this to be as easy as possible for you to do.